We held a Halloween party on Friday night, and it was the first time I've really had what I built out on display. I was a bit nervous because the top of a bookshelf in our living room has all the small things I've built in the last six months, many of which I would rather not show to people. There is the first camel and truck that I've constructed next to a much cooler Zombie school bus. I guess I should have arranged everything chronologically, an exhibit about man's evolution in building with LEGO. The exhibit could have a sign that says "work in progress," as we have only evolved to the stage of man builds like KoKo the gorilla, she of sign language fame. Although that may be an insult to Koko, I have yet to see what she can do with a box of LEGO. 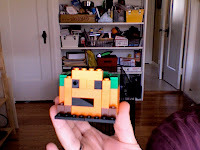 Above is a quick Jack-o-Lantern I threw together, it can fit an unlit tea candle (as LEGO and fire don't mix) and is only mildly scary.